There are manufactured products that are specifically designed to clean hot tub or spa filters. Many of those products are very expensive to buy, and sometimes our spa filters need to be cleaned when we do not have any of the specially formulated cleaners on hand. If you own a spa or hot tub you might want to consider solutions for how to clean hot tub filters at home using the everyday cleaning products that you probably already have. The filter on your hot tub is one of the most important features. It cleans the water in the spa by catching debris, tiny particles of dirt, and foreign matter so that the water going through your pump will not have any of these elements in them. They also insure that you have clean water when you get into the spa. 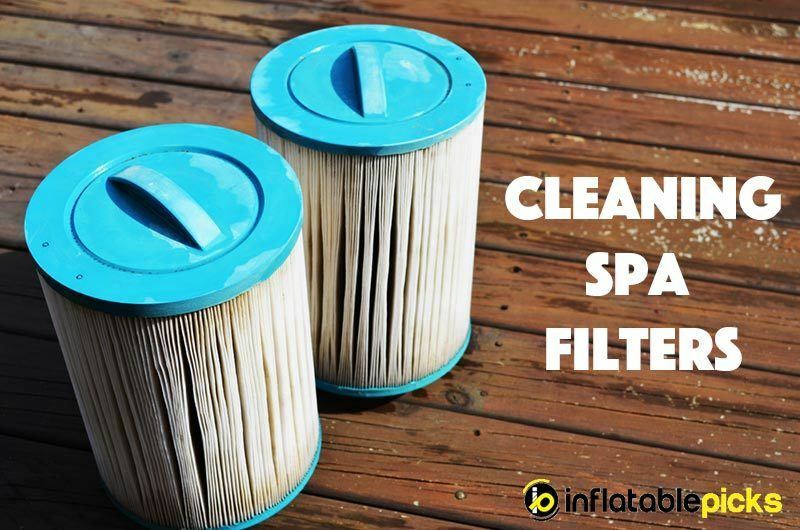 Every two weeks you should check the filter to see if it is beginning to look like it needs cleaned. If there is just a light amount of dirt you can simply rinse the filter using a garden hose. If it is starting to look grimy you are going to need to do a more thorough cleaning.To rinse the filter turn the tub off so your pump will not be running while the filter is not in place. Use your garden hose and rinse the filter and remove any large pieces of debris that you can see with your naked eye. Dry the filter off using a clean dry towel and then put it back into place. Turn your hot tub back on. One every three months you need to give the filter a more thorough cleaning. You can use filter cleaner or products you keep at home to do this job with. Once a year you should replace the filter with a new one. You can clean a hot tub or spa filter by soaking it in a cleanser so that the dirt and grime built-up on the filter material turns loose and can be rinsed away. It is important to note that you never remove the hot tub filter without turning the pump to the hot tub off. You do not want any dirt to be moved through the pump while the filter is not in place. If you clean the filter using any chemicals or soaps you need to rinse the filter thoroughly before you dry the filter. You must always dry the filter prior to replacing it in the tub. This is important. Many people have heard that you can clean hot tub filters using vinegar but they do not know how to clean spa filters with vinegar properly. Vinegar is an effective cleaning solution for hot tub and spa filters, but if the filters have gotten too grimy you may have to use something that is harsher than vinegar. Vinegar is a natural substance that will not harm humans or animals, and it has antiseptic properties that make it very good for cleaning and getting rid of germs. You want to mix the vinegar and water in a ratio of equal parts of water and vinegar. Mix this in the container and then put the filter in the container so that it is completely covered by the liquid. You need to allow the filter to remain in the liquid for not less than three hours. You can allow the filter to soak all night if you like. Once you have removed the filter from the liquid you need to rinse it thoroughly. Vinegar is not a harmful substance but the filter should still be adequately rinsed after it has been soaked so that any tiny particles that you cannot see will be loosened and washed away. You should allow the filter to dry for a period of twenty four hours before you put it back into the hot tub. You can also soak the filter in a solution of water and liquid dish detergent or gentle laundry detergent. You can clean the filter by spraying it with diluted bleach. You need to mix the bleach and water equally and then spritz the bleach onto the surface of the filter using a spray bottle. DO NOT allow the bleach to sit on the filter for an extended period of time. Once you have sprayed the filter with the bleach you can allow it to sit on the filter for a period of about ten minutes and then you need to thoroughly rinse the filter and remove the bleach. Be sure that you dry the filter at least twenty four hours before you install it. You can also clean most spa filters in the dishwasher. Some people like to run their dishwasher with no detergent when they have their spa filters in them, but you can use detergent, you simply need to make certain that you thoroughly rinse the filter prior to drying and reinstalling it. It is best if you wash the filter with no other dishes or items in the dishwasher. You do not want any food particles or greasy residue from food to be displaced and caught by the filter. You want to run your dishwasher on the longest possible cycle, and detergent will allow the dishwasher to cleanse the filter better. When you get the filter out of the dishwasher be certain that you rinse it thoroughly with clean water, and then allow the filter to dry for twenty four hours before you place it back into your hot tub.